A trio of well-known poker pros are among the eight players bringing a civil case against Excapsa Software – the previous owners of poker room Ultimate Bet. Canadian Brad Booth and Americans Dustin ‘Neverwin’ Woolf and Tom Koral have been named among the octet that have filed a RICO (Racketeer Influenced and Corrupt Organizations Act) complaint against the Cereus Poker Network website. All eight plaintiffs are former players with the now-defunct UB and claim that the poker room embezzled $20 million from regular customers by means of an in-house hole-card sting maintained by some former employees. Brad Booth, of Whitehorse in the Yukon, has enjoyed some highs in his live poker career, having recorded his biggest cash win – for $319,180 – back in June of 2006 after finishing third in the $10,000 buy-in World Poker Tour (WPT) No-Limit Hold’em Championship event as part of the Mandalay Bay Poker Championship in Las Vegas. And he has been particularly vociferous in his criticism of UB when talking about the scam, which hit the headlines across North America, following complaints from players that employees with the company had been using peculiar usernames and utilising software to view opponents’ hidden hole cards. Brad Booth believes the scandal has ruined much of his life, recalling as he spoke to host Bryan ‘The Icon’ Micon of DonkDown Radio back on February 23 last year that he is certain UB has stolen $2 million of his own cash, as well as significant sums of money he had borrowed from fellow players. Chicago’s Tom Koral – a very successful live poker pro, having pocketed $226,708 for winning the $3,125 No-Limit Hold’em main event at the Chicago Poker Classic in Harrahs Horseshoe Casino in March last year – and 18-time World Series of Poker (WSOP) in-the-money player Woolf, of Los Angeles, have also voiced their suspicions. The complaint revealed that the players are looking for an injunction, as well as damages, relating to a series of charges, including negligence, fraud and unfair business practices, intentional infliction of emotional distress, interference with prospective economic damage, conversion and RICO conspiracy. 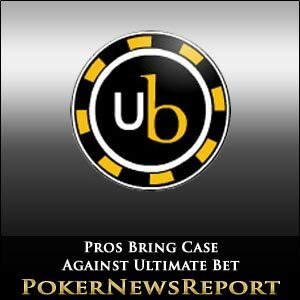 Ultimate Bet were, of course, among numerous online poker sites – including PokerStars, Full Tilt Poker and fellow Cereus Poker Network website Absolute Poker – shut down by the US Department of Justice (DoJ) on Black Friday last April 15, when the government body accused them of violating gambling laws when processing money transfers. 6356095 Canada Inc – who were formerly known as ExcapsaSoftware Inc – are the defendants, as are 10 unidentified workers with the company, and will now have the opportunity to individually respond to the charges while also explaining their views on the corruption outrage. Black Friday never seems far from the news, with Ira Rubin pleading guilty, in a US District Court in New York, to conspiring to help the Cereus Network, Full Tilt and PokerStars process payments that infringe the UIGEA (The Unlawful Internet Gambling Enforcement Act of 2006). The poker payment processor has been in jail following his April arrest, along with 10 other men indicted that day, and took a plea deal that could see him serve 18 to two years for his crimes when he is sentenced in Manhattan in May. The 53-year-old, who was detained in Guatemala near the end of April and then extradited to the USA, was accused of nine crimes, including helping the poker rooms deceive banks and disguise payments as online transactions with shell firms – which are companies that serve as a means to allow business transactions without having any noteworthy operations or assets.